Exceptional pumping system design is a giant step toward a high-performing geothermal heat pump system. 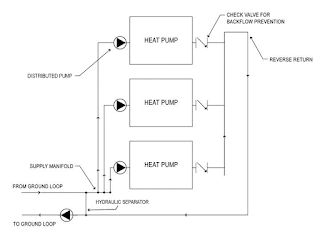 Pump power consumption can drastically impact the overall efficiency of the GSHP system which ultimately affects the amount of heat rejection that the ground loop has to accommodate (which affects size and first cost). There are many ways to approach pumping system layout and design, but they generally fall into one of two categories: centralized or distributed. As with anything else, the process of finding the best approach given your application starts with an evaluation of the the project. A distributed pumping system typically uses a circulator per heat pump (or zone) to provide sufficient flow for that unit (or zone). 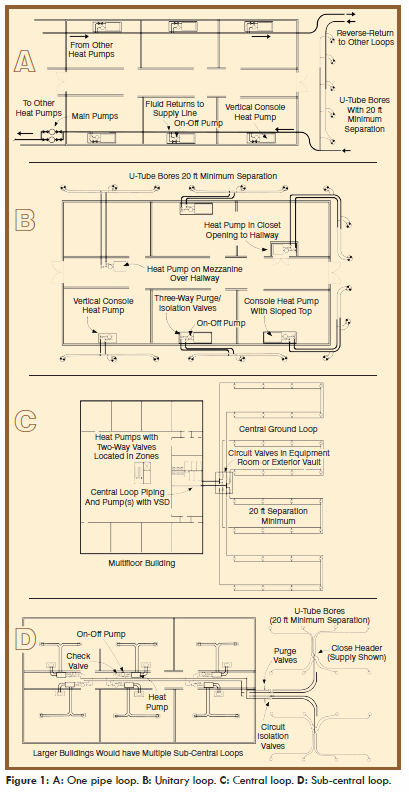 In many cases, a separate (variable speed) pump will be used to produce flow through the loopfield in addition to the circulators for each unit in the building, as shown in the illustration. While there is no limit to the size of the system that can be designed with a distributed pumping philosophy, this approach is best suited to unitary or sub-central systems where small circulators can be combined to meet system pressure/flow requirements1. After comparing the installation and operating costs to the alternatives, it is also important to evaluate the maintenance requirements relative to personnel capabilities with a distributed system, which will generally be higher than a centralized solution. Piping design can mimic the simplicity of a residential / light commercial system, which is easier and less expensive to install. Simple on-off control can be used. Flow can be reduced all the way down to the needs of a single heat pump, whereas a central pump will have a lower operating limit (generally 20-25% of design). If a single pump fails or is taken offline, the rest of the system will be unaffected and able to operate normally. Net pumping energy and related operating costs are often the lowest with this approach2. Small pumps generally have lower overall efficiency values than larger pumps. The number of possible failure points, as well as the number of pumps to maintain will be far greater compared to a centralized pumping solution. Large buildings with unitary or sub-central ground loop arrangements1. The installation of check valves for backflow prevention when the units are off will be necessary at each heat pump. Because of the relatively poor efficiency of small circulator pumps, it is critical to minimize friction losses in the piping system to maintain high system efficiency. The best energy management strategy is to turn things off when you don’t need them. 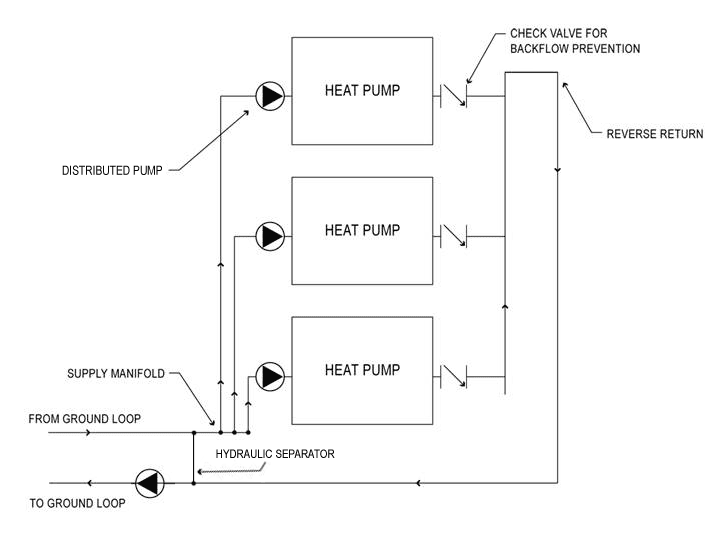 With distributed pumps, simple on-off control can be used which has been shown to drastically reduce pump energy use. But having a large number of pumps scattered throughout a building may not be conducive to staying within maintenance budgets or personnel capabilities. If maintenance requirements are a concern, it may be worth looking at the Pros and Cons of Centralized Pumping to see if that strategy is a better fit for your system. A field study showed that on-off pump control strategies provide the highest ENERGY STAR ratings and that variable speed pumping systems do not perform as well as predicted. In the study, the average pump size was 6.6 hp per 100 tons for unitary on-off pumping systems whereas the average pump energy size was 13.5 hp per 100 tons for central variable speed pumping systems.